ADRIANE is an easy-to-use, talking desktop system with optional support for braille, which can be used entirely without vision oriented output devices. Especially access to standard internet services like email, surfing the web, scanning and reading of printed documents and using mobile phone extension services like SMS (over the users own mobile phone) are supported. Especially blind people, who have no or very few computer skills, and/or have had bad encounters with graphic-focused computer interfaces, may experience an easy entry to the digital world. But also people with normal vision, who prefer a less complicated step-by-step menu, instead of an icon/animation-overloaded and over-complex graphical desktop, may profit from ADRIANE. Reading and writing/answering email, provided you have an email account. Scanning, speaking or saving of printed texts like mail, newspaper articles or books. Playing of audio or video files, digital TV via DVB-T. Creating and managing of short notes or text files. Compact database for adresses and phone numbers. Using Short-Messaging-Service (reading and writing/answering SMS) and using mobile internet access with your own cellphone. Connection between computer and phone via bluetooth or cable. Caution: While most (even the cheapest) cell phones do support the "modem function" needed for this feature, there are still some that won't work. For managing your own documents, adresses and notes, multimedia files and such, a rather simple file manager is integrated into the ADRIANE menus, which also allows on-demand inclusion of flash disks and other removable media. Graphics mode is the "mouse-oriented" desktop known to many users, which is made accessible by the graphical screenreader orca and compiz-fusions zoom functions for vision impaired users. Here, openoffice and firefox as well as many other graphical applications are available. Adjustments for volume of speech output, standard page orientation for text recognition, network and other settings can be changed here. The ADRIANE menu system can be taylored to contain additional applcations, or just a subset (the "favourites") of the user. ADRIANE uses SBL (Screenreader for Blind Linux Users) from Marco Skambraks and Halim Sahin with Debian-integration by Klaus Knopper, speech-dispatcher/espeak as speech engine. 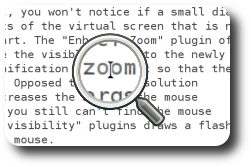 Because of a python bridge, the screenreader also interoperates with orca, which is the graphical screenreader used together with compiz-fusions zoom functions after switching to graphical mode. The easy audio-desktop is being realized by dialog and bash-scripts in a consistent user interface, and is therefore very portable and easily extensible. Sources and packages of extensions specific to ADRIANE, can be found inside the KNOPPIX repositories. to copy and give away the software in its original form, or with your modifications, provided that the new recipients get the same rights that you received with the software. ADRIANE has been part of the KNOPPIX Live CD/DVD since Version 5.3 and is available for download from the KNOPPIX Mirrors. Entering boot option adriane will start the KNOPPIX directly with speech support. The special ADRIANE edition of the KNOPPIX CD version has this option already set by default. Various independent vendors also sell computers preinstalled and preconfigured with ADRIANE, or offer installation support and a short introduction and teaching about ADRIANE. Notice: For 32-bit computer systems, please use adriane instead of adriane64.